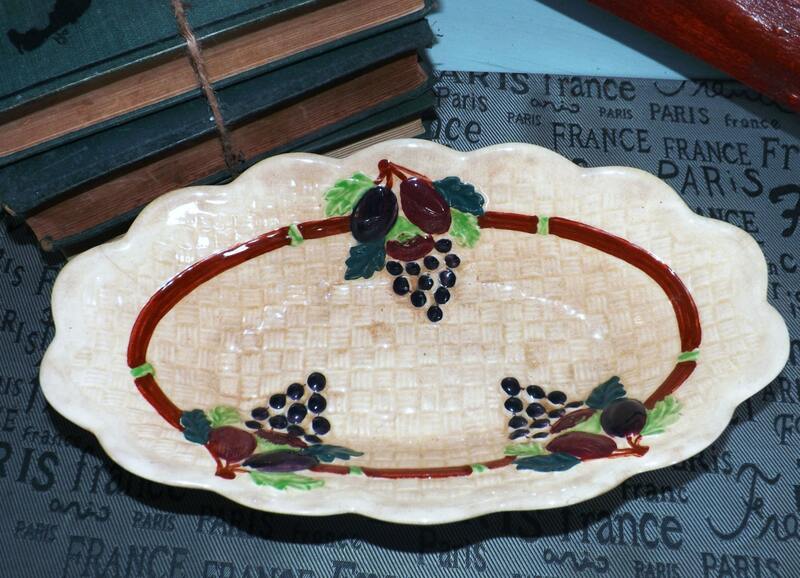 Quite vintage (1930s) Shorter & Son majolica hand-painted bread, cranberry or sweetmeats tray | bowl. Scalloped edge, basketweave design. 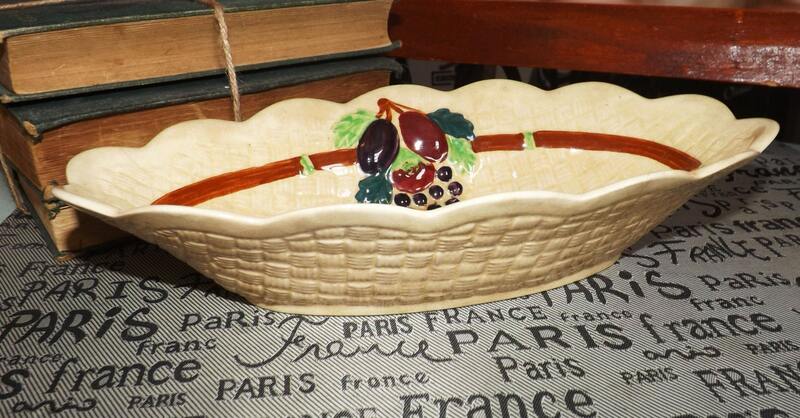 Vintage (1930s) Shorter & Son oval, majolica serving dish | bowl suitable for table presentation of cranberry, sweetmeats, chutney or bread. Basket-weave texture with embossed | majolica fruit and accents set against a caramel-colored ground in a basketweave pattern. History of Shorter & Son: The pottery which came to be known as Shorter & Son was first set-up in 1878 by Arthur Shorter with business partner James Boulton in Stoke on Trent, England. The Company's wares were solidly in the mainstream of Victorian taste featuring majolica of all types: jugs, bowls, flower pots and tableware. 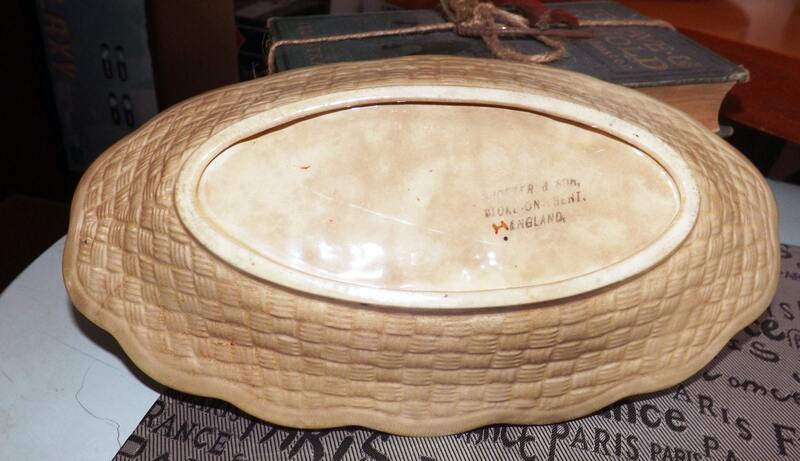 In 1891 Arthur’s brother-in-law, also a well-known pottery owner, A. J. Wilkinson died in an accident and thus, Arthur took over management of the Wilkinson pottery, later purchasing the firm outright. 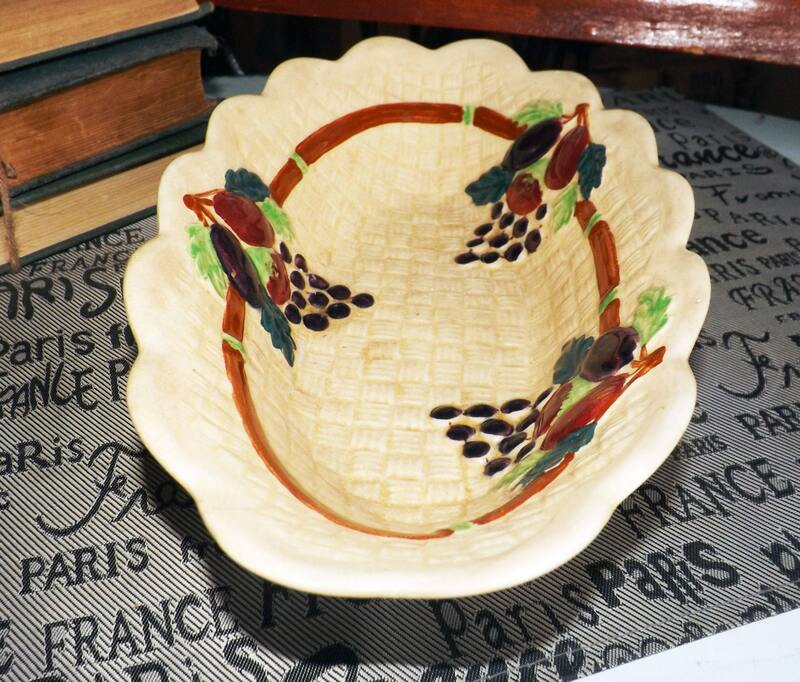 Future generations of Shorters continued to run the firm and took inspiration from the bold designs of Clarice Cliff who began her career at the Wilkinson pottery. 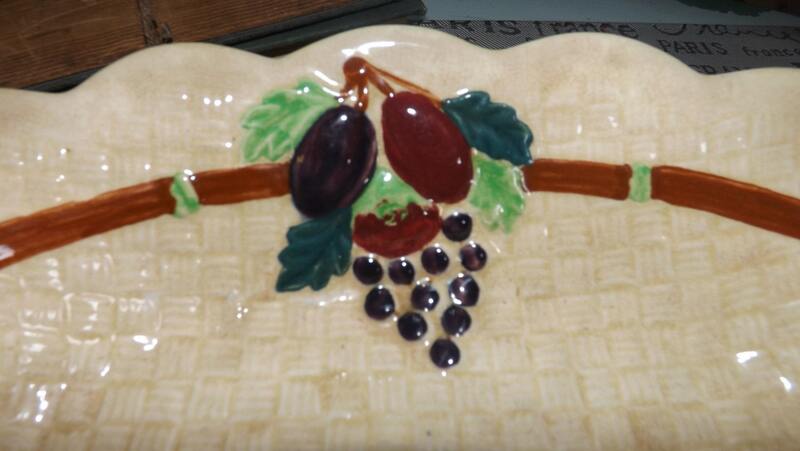 This very pretty majolica serving dish or bowl is in EXCELLENT! vintage condition, with NO! chips, cracks or fleabites and NO! appreciable crazing. There is some browning/yellowing through the glaze in random patches, predominantly to the base and sides of the bowl and to the REVERSE (please DO! review the posted photos for a complete visual of the item), but otherwise there are NO! marks or stains and NO! scratches or other signs of use or wear. The embossed, colored fruits are bright and vivid with NO! appreciable fading. Painter's brush mark - H - to base of dish in red. Approximate measurements: 10-3/4" in length x 6" in width x 2-1/4" in depth with a scalloped edge and a basketweave ground.